For over a century, public drainage system maintenance and repair in Minnesota has been funded by assessing real property that drains to the system. Assessments are in the same proportion as the original assessment for construction, unless valuations have been updated through administrative procedures that often require extensive fieldwork and are expensive. For several years, the Drainage Work Group (DWG), representing public and private groups with an interest in drainage matters and facilitated by the Chief Engineer, Minnesota Board of Water and Soil Resources, has worked to develop an alternative funding method. In March, the DWG reached consensus on proposed revisions to the Minnesota Drainage Code (chapter 103E) to allow this method. The revisions are in legislation that has passed through Senate and House committees and appears likely to be enacted. Under the legislation, when a drainage system is to be repaired, the drainage authority may choose the traditional or the new method to assess cost. 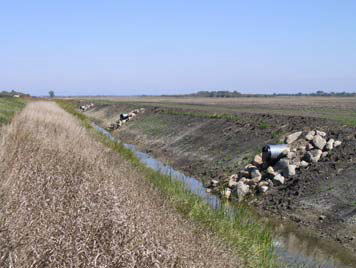 The alternative, known as the “Runoff and Sediment Delivery Option” (RSDO), relies on Geographic Information System methods and new runoff and soil loss modeling capability to allocate drainage system maintenance cost on the basis of how much a tract of land contributes to that cost through accelerated runoff and contribution of sediment. In addition to being more equitable, proponents believe this will substantially reduce the time and cost to administer drainage systems. Also, where model inputs - and thus maintenance charges - can be adjusted easily on a tract basis to reflect changes in practices, the RSDO enhances the incentive for landowners to adopt improved practices.